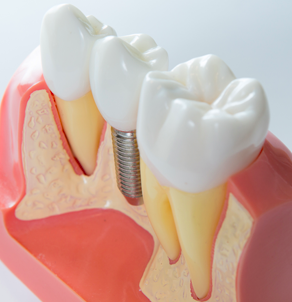 Dental implants are the most effective method for replacing missing teeth. Using the most recent advances in dental implant technology, Drs. Topf, Bournias, Murphy or Bolten are able to place single stage implants. These implants do not require a second procedure to uncover them, but do require a minimum of six weeks of healing time before artificial teeth are placed. There are even situations where the implant can be placed at the same time as the tooth extraction – further minimizing your number of surgical procedures. Dental implant placement is a team effort between an oral and maxillofacial surgeon and a restorative dentist. Drs. Topf, Bournias, Murphy or Bolten performs the actual implant surgery, initial tooth extractions, and bone grafting, if necessary. The restorative dentist (your dentist) fits and makes the permanent prosthesis. Your dentist will also make any temporary prosthesis needed during the implant process.